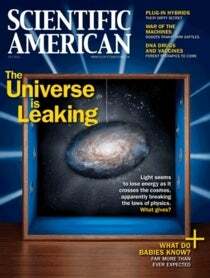 As I type this letter, I am sitting in a hotel room in Barcelona, Spain, having just completed an important but little-known meeting: the twice-a-year gathering of editors and other members of Scientific American’s international editions. Reflecting the scientific enterprise itself, the producers of the 14 local-language editions are spread around the world. Although we are in frequent e-mail and phone contact through­out the year, we also meet in person in various cities, the better to learn from one another. Around the long table were representatives from Brazil, China, Japan, Kuwait, Russia and essentially every European nation. Our collective readership is a diverse audience that numbers more than one million, but they all share a passion for science and technology. And we, as editors, share a common mission to comb the globe for the science that matters, the better to serve those readers. Members of the editions traded intelligence on best practices and also shared new ideas. One initiative, which I expect to be under way on www.ScientificAmerican.com by the time you read this, is to conduct global surveys about science topics, working together and also in partnership with the journal Nature (which is in the same Macmillan corporate family). I will report further in the coming months. Along with our global reach, we at Scientific American take pride in our unique inclusion of scientist authors, who collaborate with us on many of our feature articles and give us a distinctive perspective. More rarefied still are the scientists who have achieved the honor of winning a Nobel Prize, and 143 Nobelists have contributed a collective total of 232 pieces to Scien­tific American, often years before their work was recognized in Stockholm. Just as those Nobelists have provided their insights in our pages, they have also shared their wisdom and encouragement in lectures and conversations with young scientists at another important but underappreciated assembly, the Nobel Laureate Meetings in Lindau, Germany. This year marks the event’s 60th anniversary, and it will include some 60 laureates and more than 600 young scientists. I will also be there, feeling humble among so many brilliant minds but eager to listen, learn—and then to share with readers. Look for my blog posts about the meeting at the end of June on www.ScientificAmerican.com; we will also be posting videos and other coverage from the conference during that time and in subsequent months. Last, but certainly not least, I direct you to the scientific marvels within this issue. You can explore the strange apparent “lost” energy of the cosmos, in “Is the Universe Leaking Energy?” by Tamara M. Davis. Learn the latest about promising vaccines and medicines in “DNA Drugs Come of Age,” by Matthew P. Morrow and David B. Weiner. Watch robots remake the modern battlefield in “War of the Machines,” by P. W. Singer. And delve into that most mysterious terrain: the infant mind. Check out “How Babies Think,” by Alison Gopnik.